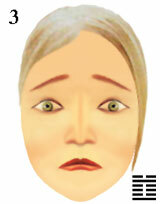 Gallery of emotions and hexagrams for cosmetic make-up. It is possible to consider the shown physiognomic symbols and hexagrams of the canon of changes i-jing as logic set of constructive or stylistic facial templates for female beauty, namely as visual generator of emotional images which are necessary for art displaying in woman face during cosmetic make-up. The open eyes seem gloomy as eyebrows and mouth express sad emotions. Sad eyebrows and mouth seem outspoken as eyes express open emotions. The person thinks about sad thing or object of a life and sadly looks at world around. Desires are executed not how the person assumed. symbols of hexagrams and cosmetic make-up for woman.